It seems South Africa would be stuck in a passenger rail crises for some years to come. 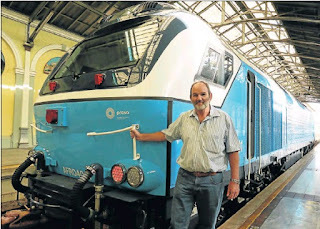 The Passenger Rail Agency of South Africa (Prasa) wants to return the Afro 4000 trains which are unsuitable for local conditions, and get a refund for the R2.65 billion it has already paid for the order. The Sunday Times reported that Prasa launched court action to “recover from one of South Africa’s biggest ever tender debacles involving billions of rands”. In July the Afro 4000 trains made headlines after Rapport revealed that the locomotives were unsuitable for South African infastructure as the height of the trains is 4.264m, whereas the national limit was 3.965m. The problem with Afro 4000 trains continued after one of the locomotives derailed. Prasa officials struggled to establish what went wrong, because the trains only ‘communicated’ in Spanish. Former Prasa CEO Lucky Montana had downplayed the concerns, and tried to convince South Africans that the trains are indeed suitable for the local railway network. Since then Montana and former Prasa’s head of engineering services Daniel Mthimkhulu were fired, and the Hawks have launched a criminal investigation into Mtimkhulu and Montana for corruption. It also emerged that Mthimkhulu was not a registered engineer, and that the Engineering Council of South Africa (Ecsa) rejected Mtimkhulu’s application to register with it in 2006.